Rome wasn’t build in a day. The course of true love never runs smooth. You could add to these tried and tested sayings; If you build a shed you will encounter problems. 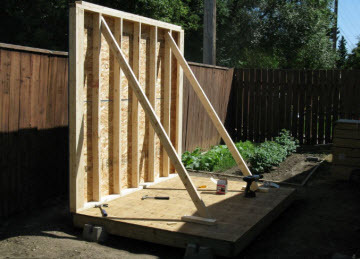 For most people building a shed will be a one-off project. Starting from zero knowledge, learning about the task they are about to undertake and finally ending up with a serviceable storage building. During the course of the project you will inevitably encounter problems as part of the learning process. Mistakes will be made and overcome. To illustrate this point I wanted to highlight a project undertaken by a reader of this site Ron Clemens. 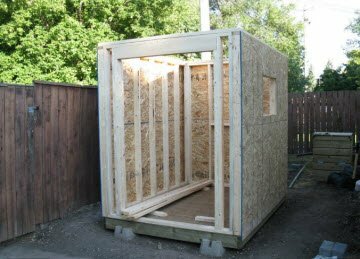 Ron Clemens lives in Saskatchewan, Canada and had reached the point in his project where he was ready to install his shed windows. I'm fairly new at wood-working, and recently started building a shed. I planned on using a 20” x 30” Prestofen slider shed window, and upon asking a “window expert” at Home Depot how big to make the rough opening, he assured me it should be 20” x 30”. I didn’t buy the window at that time, but went ahead and framed the shed wall according to this specification. I reached a point in construction where I was ready for the window installation, and so went back to Home Depot and purchased the window. Assuming that the outer “flange” of the window would mount flush against the exterior wall sheathing, I was disappointed to discover that the actual outside dimensions of the window are less than 20” x 30”, making the entire window smaller than the rough opening." We exchanged a few emails to discuss the problem and Ron continued with the build. "For the window blunder, I ended up building up the window framing, then re-sheathing that part of the wall and cutting the rough opening to the correct size. It all worked out in the end. I was able to find some recycled cedar siding for the exterior, which I liked since it was an environmentally conscious choice. 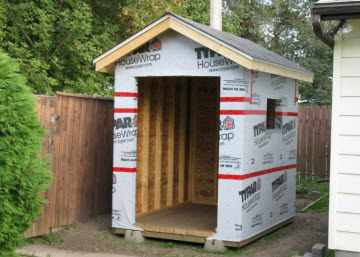 As the building of my shed progressed, it came to be known in my eyes as "the monument to my incompetence"...hehe! But then again, maybe if other people see that a completely clueless rookie can stumble through and end up with something acceptable, they might be inspired to take the task on themselves." 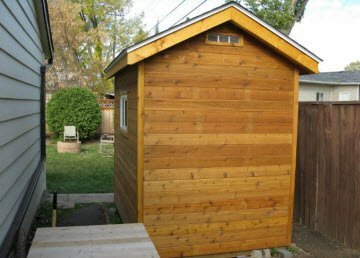 Ron was kind enough to share some pictures of his shed build and I think that you will find them very interesting. Structure of shed roof in place. Roof is supported on a central ridge beam. The completed shed – a job well done! I think that you will agree that is a great result a fine looking shed that I am sure will last through many Canadian winters. One construction saying that I would like you to remember as you progress through your project is that ‘The job always gets built’. I have come across this saying on construction sites wherever in the world I have worked. As you work through your shed building project I think that you will find it as true for Ron as it will be for you. 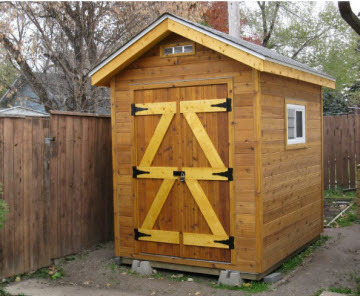 What problems did you overcome during your shed building project? I am in the process of building my 3rd shed with a barn style roof (don't know the proper name) and never take the time to make a template for constructing the roof trusses to ensure they a consistent shape. As a result, I always end up having to shim the outsides of some trusses to make them even before installing the sheathing or strapping. This is unnecessary work that I think could have been avoided by making a template on the floor and making the trusses accordingly. Shed will be 8'x8' (that's all I can fit in) I've seen other projects that use EPDM will investigate further when I get to that stage. @ Joe - Thanks for sharing your problem. Getting the blocks level is always a challenge. Start with getting the corners for one of the long sides in at the right level and then work on the blocks in between. When you have all of these in right work on the next two corners and then the between blocks checking back to the reference blocks at each stage. Your perseverance at this stage will be repaid when you construct the floor and then the walls and everything is ?dead? level. @ Mark - Well done on progressing towards your green roof project. To keep the roof as simple as possible I would continue with the box type idea keeping the roof joists level. On top of the joists you can introduce a ?firring? strip to introduce the fall on to the roof so that there is some positive drainage and you don?t get water ponding. I would recommend using an EPDM rubber roofing membrane. These sheets come all in one piece and have a long lifespan, so minimise the possibilities of leaks. 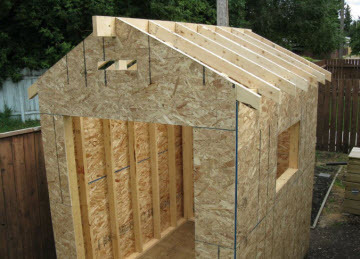 What size shed are you looking to build? @ Simon - Well done on building your 'oestrogen retreat'. And great solution to overcoming the problem with your water main. I have a house built in the 50s also. The water main is about 3 feet down and reached the end of its life last year and developed a leak. I had to have the whole thing replaced......ouch! Level?? What do you mean Level? I purchased a simple tin shed to construct for a place to store my motor bike and escape the rigures of being the only male in the house. My front lawn slopes so I dug down approx 100mm (4 inches) and discovered that when my house was built in the 50's 80mm (3") was how deep the water mains were planted... so I built UP! Retaining walls 300mm high, and a nice long slow ramp up to the newly installed patio means that not only do I have a shed, but a nice area outside to enjoy the Summer afternoons. I'm at the planning stage for a shed/garden office, I want a flat roof and preferably a green (plants not colour) roof. My problem is working out an easy way to build the roof while keeping it simple both in looks and construction. I've thought of building the basic shed as a cube with a false sloping roof. My problem is getting started. 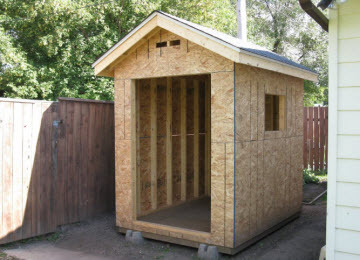 I want to build a 12x8 shed on a using blocks as a foundation. The site is not very level and I'm having trouble leveling the blocks using the 8 foot 2x4 and level method. If I get them leveled north/south then the east/west is off. I work in construction so thought that building a shed would be a straight forward operation, I mean sheds are a lot smaller than office buildings, right? Well my problem was that I got my sequencing wrong. I fitted the roof sheathing and shingles before starting to install the soffit boards. The reason for this was to keep out the weather. It did keep the inside of the shed dry but cutting all those soffit boards and trim to shape and then holding them in position whilst working around the already fixed roof was a major headache. Next time I would install the roof trim and soffit boards before the roof sheathing. This apparently minor mistake cost me a lot of time and effort. 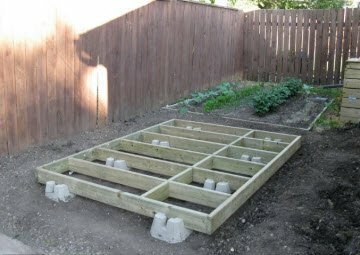 Do you know that there are 6 different types of shed foundation? This is probably the lightest form of shed foundation. Return to Building a shed case studies.